Well I think it's safe to say final year of uni is taking over my life...as well a being Chair of the archery club. Until last night, I hadn't painted my nails since Halloween! I finally decided enough was enough and even though it was about half 11, I put on a film and got a few swatches done. I've had these polishes sitting on my shelf for a good few months now and as I discovered they are still available, I thought I would try them first. This is the Hipster Trio from Painted Polish and I purchased them from Rainbow Connection UK. I think I now have four trios from Painted Polish and I have to say this may be my favourite of them all. I just really love the bright colours and was soo happy with all three polishes. To start off we have 'Beards & Bow Ties' which is a fab mix of fuchsia, gold, orange and sky blue holographic glitters in a white crelly base. I always expect these to be difficult to apply but they're really not. Super easy and opaque in two coats. This swatch shows two coats with topcoat. The next polish is 'V-Necks & Vinyl', a bright fuchsia ultra holo with added silver holographic glitters. Because of my pink aversion when I first started nail art etc. 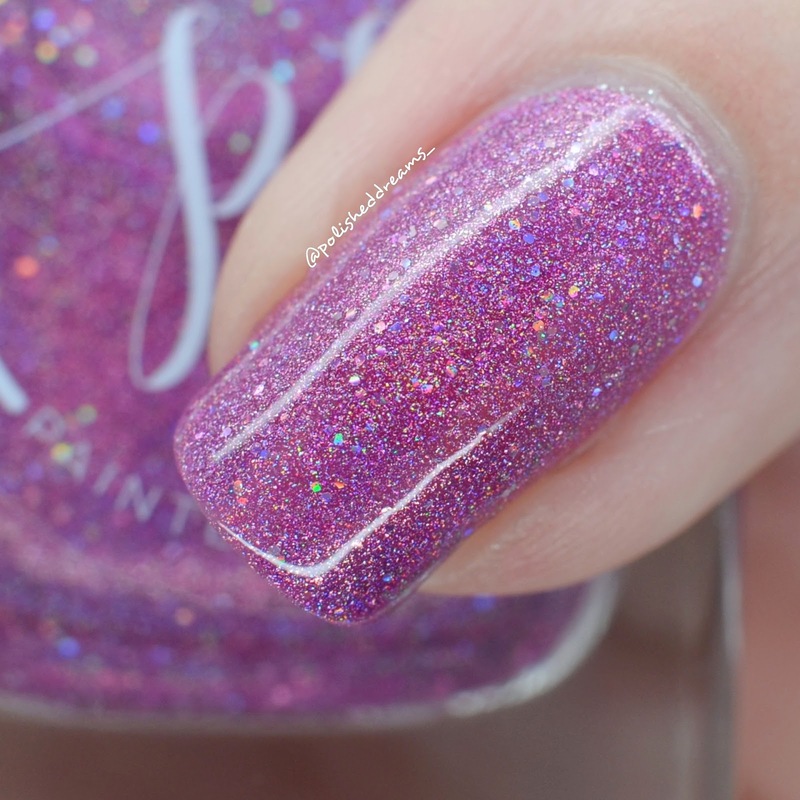 I don't seem to have many pink holos so I'm very happy to add this to my collection as it is stunning! Absolutely perfect formula and shown here in two coats with topcoat. The final polish in the trio is the glitter twin to 'Beards & Bowties'. 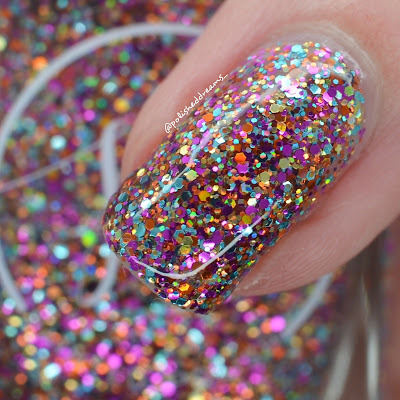 This beauty is 'Mix Tapes & Man Buns' and has the same fuschia, orange, gold and sky blue glitters but in a clear base. 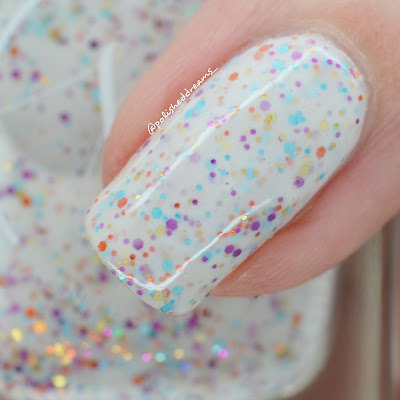 I'm really not a fan of sponging glitters so I always paint them on as usual which usually results in some less opaque patches but unless you're looking at them up close (like in swatch photos), it's not something you notice. This swatch shows two coats with topcoat. As I said at the start, I do really love this trio. Painted Polish are a brand that I really adore but just don't have the money to spend on regularly. One day when I'm a rich psychologist I will buy all the polishes I want! These are still available here on Rainbow Connection UK priced from £8.80-£11 so definitely grab them if you like the look of them. I believe they're also limited edition so I'm surprised they're still around! Did you like these? 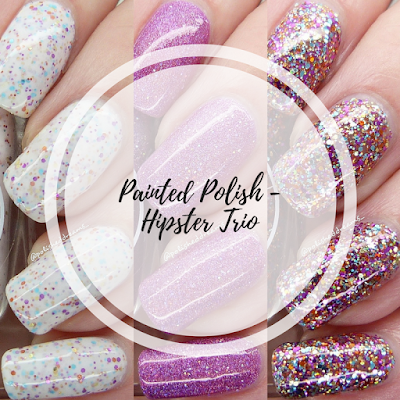 What's your favourite Painted Polish trio?